So with those thoughts in mind, I thought we’d provide a quick workflow introduction and some quick and easy workflow recipes for non-profits and the Non-Profit Starter Pack (NPSP). Some of these you may have seen elsewhere before, but hopefully some will be new to you as well. If you’re not familiar with workflow, and are using the NPSP, you’re already a frequent workflow user. Check out Setup->Create->Workflow & Approval ->Workflow Rules in your org to see all of the rules that come with the NPSP. Workflow is already managing your preferred phone and email settings on your contact records, no code required. There are few main steps in building a workflow rule. Let’s click on the ‘New Rule’ button on our Workflow Rules page and build a classic birthday reminder rule together so we never forget to wish another donor a happy birthday. After we’re done, I’ll share some other quick workflow recipes you can implement today! 1. We need to select the object to which the workflow rule applies. Or, in other words, workflow happens when a record is inserted/updated/deleted. What kind of record do I want to my workflow to trigger off of? In this case, let’s select a ‘Contact’ and click next. 3. Now we need to add a workflow action. 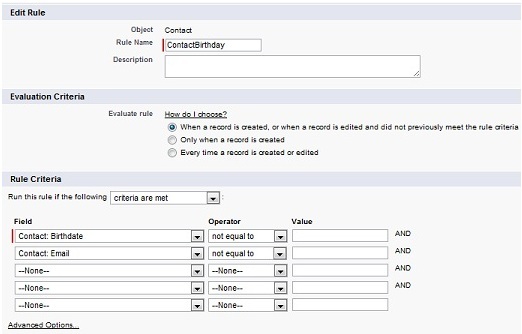 In other words, when a contact is entered or updated to include both a birthday and an email address, what should we do? We could do something immediately, but what if it’s not the contacts birthday? We don’t want to be emailing them on a random Tuesday in March if their birthday is in May. So, instead we turn to Time-Dependent Workflow. b. 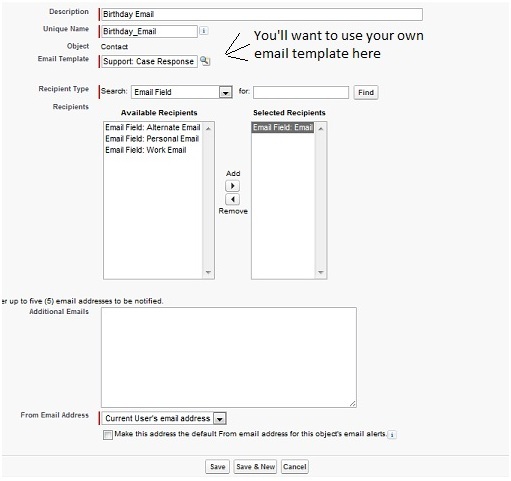 Use the ‘Add Workflow Action’ in the Time Dependent Workflow Action section, and select ‘New Email Alert’. Provide a Description of the Action, and select an Email Template. You may want to create a separate email template for your birthday emails. Here, we’ll use a random sample template as an example. c. Our Recipient Type is ‘Email Field’, then ‘Email Field: Email’ from the pick list below. Click ‘Add’ to place it in the ‘Selected Recipients’. In the NPSP, the ‘Email’ field should always contain the preferred email for your contacts. Remember, we’ll have an email since our workflow won’t fire if it doesn’t exist! Click ‘Save’. We’ve covered the basics, so let’s talk about some other rules you can use. Add workflow action ‘New Task’ assigned to your ED’s user. Provide a subject, status, unique name and priority, and click the ‘Notify Assignee’ checkbox, with a due date of the opportunity close date plus 7 days. Your ED will now get an email that they have a new task assigned to them to thank this donor within seven days of the donation closing, with a link back to the donation they need to thank. Isn’t assigning work to others great? When a record is created or edited and did not previously meet criteria, and the following criteria are met ‘Contact: Total Gifts’ greater than $10000. Add workflow action ‘New Field Update’. Field to Update ‘Donor Tier’, set a specific value: ‘Platinum’. Send a new Email Alert to the contact, just like in our birthday email above. We’ll probably want an email template asking the contact to confirm their address change with the new address in the email. Hopefully you found some of these examples useful, I highly encourage you to dive into workflow and try out some rules of your own, it’s a great way to dip your toes into the world of automation and hands free database maintenance. Please make sure to share your results, questions and tips back with the community!